The Ultimate Tool of White Supremacy (in the 3rd grade)? Brownies! 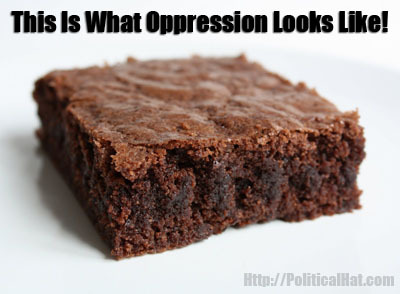 Brownies, the moist chocolaty treat, is now considered racist. “There was a police officer with a gun in the holster talking to my son, saying, ‘Tell me what you said.’ He didn’t have anybody on his side”. The police responded because they claim is potentially criminal… such as “a simple name-calling incident”. Ironically enough, the boy’s father is from Latin America. This entry was posted in Education, Progressives and tagged derp, FacePalm, Leviathan, Social Justice, WTF. Bookmark the permalink. 1 Response to The Ultimate Tool of White Supremacy (in the 3rd grade)? Brownies!